Characteristics: quick growing though slow starting from seeds, can be invasive with deep and thick roots, tree body is resistant to insects and fungal. 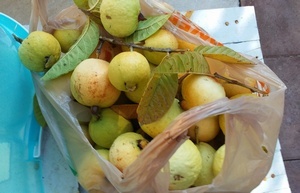 We have a number of guava trees in our garden. They are easy to grow and are good fits for California's warm and sunny weather. 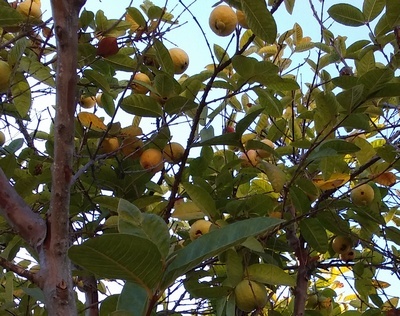 Each year, the trees produce hundreds of fruits. The fruits could be as large as a mid-size melon or as small as a lemon. Guavas are known for their health benefits. Eating the fruits could reduce cancer risks, aid digestion, help with weight loss and prevent viral infections. Consequently, the fruits make great gifts; the birds adore them as well. Guava's leaves are sometimes used as herbal medicine to reduce fever and treat cold. In harvest seasons, visitors and guests love to pick fruits from our trees -- occasionally without permission.